women. 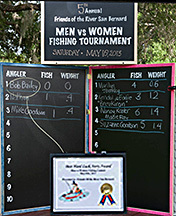 It was mostly a no-show for the male anglers who were probably afraid of looking bad in the competition. Kendal and Eadie O'Callaghan, granddaughters of San Bernardites Marie and Bob Breakiron, share the “Heaviest Fish Caught” award. Mike Goodson holds the “Most Unusual Catch” certificate he received for reeling in a sock and two plastic bait buckets. The girls caught the fish off our pier that morning using bait fish caught by Bob. They had a great time fishing with grand dad, & even more fun observing their "catch" all morning. One day, when they bring their children to the SBR, they can say; "I've been fishing this River all my life". Thank you Marilyn and Tom for organizing this year's FOR fishing tournament and thank you for the memories.